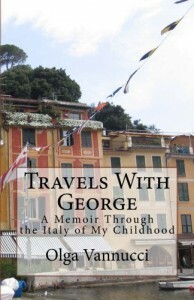 Travels With George: A Memoir Through the Italy of My Childhood by Olga Vannucci is broken up into five sections, one for each of her trips to Italy. Each section is then divided into chapters of varying lengths, like little vignettes. Some are several pages long, others only a few paragraphs. The book is written in present tense, as if the trips are happening in real time. It's a nice way of reading about her travels. She hits many of the major cities - Florence, Rome, Venice, and Milan, for example - but also smaller towns where she has either family ties or an interest. I don't particularly care to only read about the tourist traps, so this made for a nice, balanced view of the central and northern parts of country (Rome is as far south as she traveled). Truly, that is my only criticism. Otherwise, I very much enjoyed the book. Vannucci has a subtle sense of humor. It is revealed in small ways, such as when she refers to a lifeguard at a ritzy beach club: "His true role in the enterprise...is to prevent the free beach bathers from encroaching on the expensive beach club sand." Also, you can tell Vannucci is presenting herself as she actually is, quirks and all. She states early in the book that parking is her obsession. She is not kidding. She notices the parking situation everywhere they go. I had to laugh a little whenever it was mentioned. When she's frustrated with or annoyed by a situation, or even by her son, she says so. Judging from the title alone, you might think this book is a sweet, idyllic story of a mother sharing her homeland with her young son, who enthusiastically absorbs every moment. Sometimes it is; but this book is much closer reality. Children don't always appreciate or have an interest in the things important to their parents, and at times their parents end up coaxing them along. 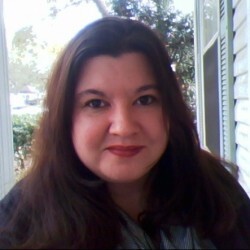 I respected the honesty of her account in that regard. Vannucci's family stories are incredibly rich, giving a personal perspective on some major events in Italian history. Even the mundane turns into something special in her telling; things as simple as how beautifully the light shines through the slats of the persiane (shutters). I liked her spontaneity, how she'd make new plans based on something she happens to see or hear along the way. And I was touched by her expression of how it felt to go back to Italy years later, after people she loved had passed. If you enjoy travel memoirs, be sure to pick up a copy of Olga Vannucci's Travels With George.